Mashpee, Massachusetts, located on Cape Cod, has a unique character that has been strongly shaped by the very presence of its first inhabitants, the Mashpee Wampanoags. Mashpee, previously known as Massipee or Marshpee, was incorporated as a town in the year 1870, to be governed the way the other New England towns were governed, the English, or Newcomers', way. Before that, however, Mashpee had long been the home of Native Americans, predominantly Wampanoags. Ernestine Gray of Mashpee is very proud of her Wampanoag heritage and has dedicated herself to preserving that heritage as much as possible for future generations. She has been working tirelessly to educate young and old about the history of Mashpee and of the Wampanoags, and to preserve the historical landmarks of Mashpee. Saving the old South Mashpee School from further deterioration is her latest dream in action. This 72-year-old great-grandmother, as she often calls herself, is lecturing, advising, consulting, researching, networking, and collecting old photographs and documents. She is always active, curious and ready to learn new things, and she simply loves to "connect with all kinds of people." She will continue to organize a variety of workshops, exhibit her old photographs, and work as a volunteer, as long as she sees that her efforts will benefit the future generations of Mashpee. "I have been involved with several organizations for the last twenty years. The most rewarding experiences include lecturing to third grade, junior high and high school students. I have also lectured in various other forums. My lectures encompass the history, mythology and legends of the Mashpee Wampanoag people." Ernestine Gray has been researching her own family history for several years, and with the help of The New England Historic Genealogical Society she learned fascinating facts about her ancestors. "Such research is tedious, time-consuming and frustrating at times," she admits. As a result of that experience, Ernestine decided to make such research a bit easier for others, to aid them in pursuing similar goals. Receiving grant money from the Thanks Be To Grandmother Winifred Foundation made it possible for Ernestine and her project team to search for and record many old documents. After several months of hard work this information is now available on CD. 1776 Town Census - shows the number of "Indians, Malatoes, and Negroes belonging to Mashpee, June 24, 1776". This list was found in the papers of Gideon Hawley. 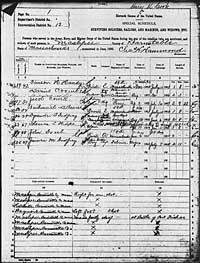 FBI Ethnology - early 1700 families in Mashpee according to FBA list. Federal Census 1800 - free white males. Earl - report of the commissioners relating to the condition of the Indian in Massachusetts in 1849. 1850 Census - "Free Inhabitants in Marshpee 1850"
Listed in order of their publishing dates. Author(s), title, subtitle, publisher, date of publishing, followed by short comments by Ernestine Gray. Pierce, Ebenezer W. Indian History, Biography and Genealogy. Zerviah Gould Mitchell. North Abington, Massachusetts.1878. A valuable account by a female descendant of an important leader of the 17th Century. Deyo, Simeon. History of Barnstable County 1890. H.W. Blake and Co. New York. Extensive early geographic names and locations. Dykes, Hannah S.B. History of Richard Bourne. Privately printed by Benjamin F. Bourne. Cleveland, Ohio. 1919. Beale, Samuel M. "The Man of Science." Jefferson Alumnae Magazine. 1963. Bonfanti, Leo. 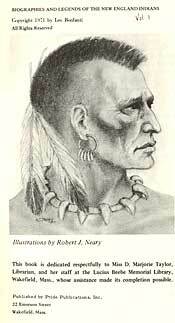 Biographies and Legends of New England Indians. Pride Publications. Wakefield, Massachusetts. There are 6 volumes that were published between 1965 and 1980. They provide valuable geographic coverage. Bingham, Amelia. Mashpee. Mashpee Historical Commission. 1970. Well prepared early histories and treasured photos. Vuilleumeier, Marion. Indians On Olde Cape Cod. William S. Sullwold Publishing. Taunton, Massachusetts. 1976. One of several publications by Friends of Mashpee--revolving about religious and humanitarian issues. Travers, Milton A. One of the Keys. Dartmouth, Massachusetts Bicentennial Commission. ISBN 0-8158-0326-5. Chase, Henry E. Note on the Wampanoag Indians. From Papers Relating to Anthropology. Brookline, Massachusetts. Informative. Many references listed. Obtained from Neil Good of Mashpee, Massachusetts. Crosby, Constance A. "From Myth to History". The Recovery of Meaning: Historical Archaeology in the Eastern United States. Smithsonian Institution Press. Washington D.C.
Peters, Russell M. The Wampanoags of Mashpee. Nimrod Press.1989. A 20th Century resident's view with interesting "then and now" photos. O'Connell, Barry. In Our Own Ground. The University of Massachusetts Press. Amherst, Massachusetts.1992. ISBN 0-87023-766. Account of Native American human abuses and collections of the writings of William Apess. Crosby, Constance A. "When Their Ancestors First Came". Society for American Archaeology Annual Meeting 1992. Pittsburgh, Pennsylvania. Crosby, Constance A. "The Algonkian Spiritual Landscape". Algonkians of New England Past and Present. Boston University. Boston, Massachusetts. 1993. 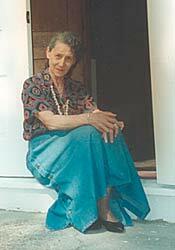 Carpenter, Delores Bird. Early Encounters. Michigan State University Press. Lansing, Michigan. 1994. ISBN 0-87013-351-9. An interesting combination of Nickerson Histories and clergy on Cape Cod. Burns, Rosemary H. 1870 Mashpee 1995. Town of Mashpee. Mashpee, Massachusetts. 1995. A celebration of the 125th Anniversary of the Town of Mashpee. Time-Life Books. Algonquians of the East Coast. Time-Life Education. Richmond, Virginia. 1995. ISBN 0-8094-9738-7. Mills, Earl Sr. and Mann, Alicja. Son of Mashpee. North Falmouth, Massachusetts. 1996. ISBN 965-4360-0-4. A fresh new perspective on old Mashpee. The purpose of this Web site is to inform the public about what kinds of documents are available and where to find them. For information about the availability of the CD, or any other inquiries, please contact Ernestine Gray. ©2001 Mashpee Yesteryear, all rights reserved. Web site text and design by Alicja Mann of Word Studio. Implementation by Jennifer Kano of WebWorks Design.